Good morning! I have a SUPER easy wood plank project to share with you, using a 12x16 wood plank from the Mix the Media collection by Jillibean Soup. My house doesn't have a lot of room on its' walls for home décor, but at certain times of the year, I always find room to add a little something on top of a cabinet in our front entrance. I made this really easy DIY piece with just a few supplies. I used the 12x16 wood plank (in raw pine) by Jillibean Soup. It is perfect for adding your own color too, just do a light sanding and add some acrylic paint! I used the Witty White Happy Hues paint by Jillibean Soup and let it dry. While it was drying, I cut the images for the wood out of black adhesive vinyl. The designs are both from the Silhouette online store. 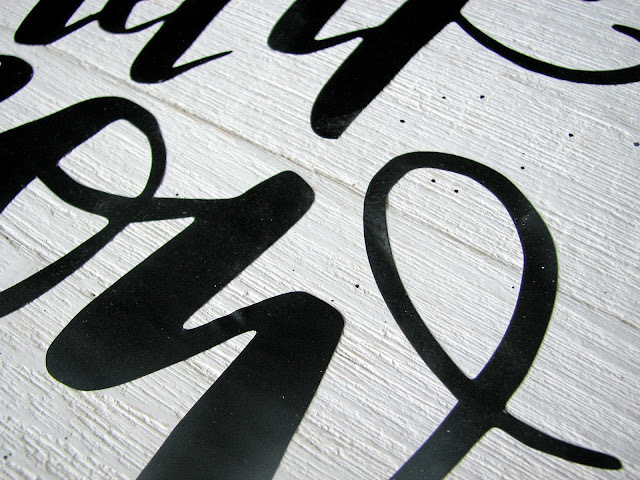 Once it was dry, I lightly sanded the edges of the wood before applying my vinyl cut design. I should have distressed it a bit more, but it still looks pretty decent in the end. As you can see, I simply added on my vinyl to the dry wood surface once it was completely dry. There are some tricks to getting it on (check out YouTube for tips), but once you get the hand of it, it's pretty easy! 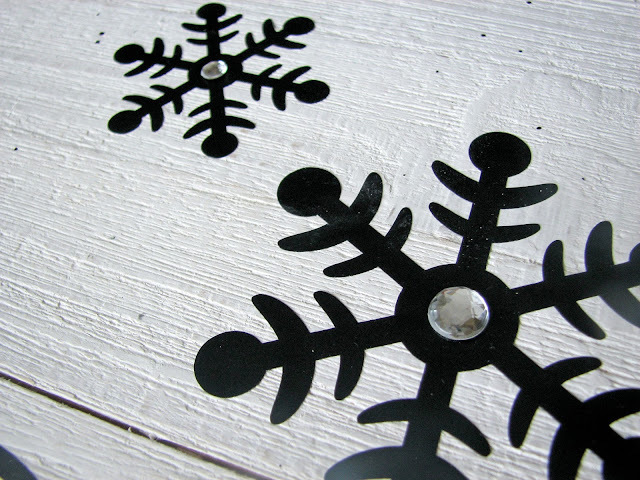 I added in some bling to the center of the snowflakes for a little sparkle and I was all done! I figure this is something that can stay around our house beyond the holidays since we have "winter" for almost 4-6 months of the year! HA! Hello! 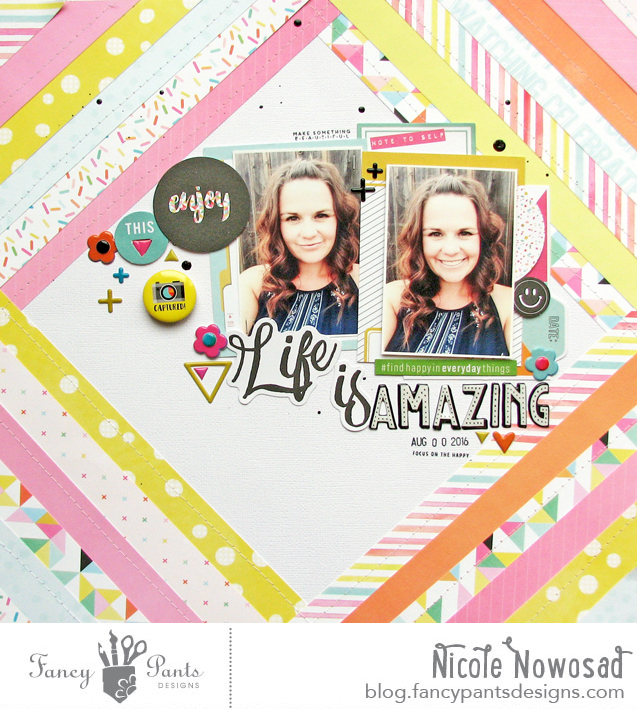 This month on the Jillibean Soup blog, the DT was challenged to use the new Day 2 Day planner items on non-planner projects! I started my page by grabbing some of the great Day 2 Day planner stickers. I used those as a grid for the bottom of my page, and as you can see, I added in some stamped rectangle in the same size for the remaining spots. Those were stamped using the Day to Day planner stamps! I filled in the top of my page with some Mini Placemats (diecut shapes) from the Sew Happy Sunshine Soup collection - I thought they kind of looked like snowflakes. I added in some star sequins and some cute little puffy stickers from the Day 2 Day planner collection too. 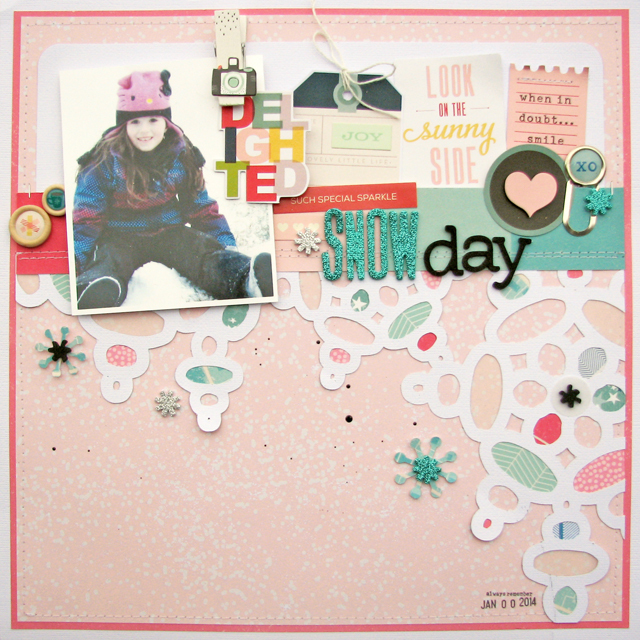 Stop by the Jillibean Soup blog today to see how some of the rest of the team took on this months' designer challenge! WINTER is coming. Yep, I said it, and now it's full on here. We have been so lucky in our city as it hasn't really been cold. If you didn't know, I am from Winnipeg, Manitoba Canada. We are known across the country for our cold winters. We are known as Winterpeg. HA! 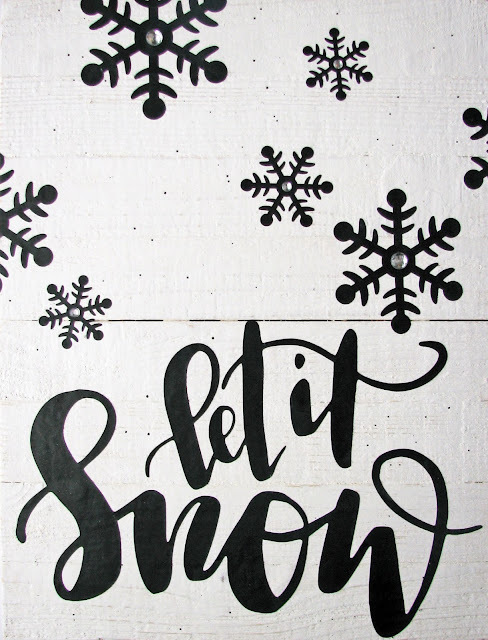 As I type this, it is snowing big fluffy flakes outside, and really, it is about time. As much as I don't like the snow, I really don't mind it either. It is just here so darn long! Because it gets do darn cold, we don't actually venture outside enough to take photos most of the time. Winter photos are pretty rare here, which is pretty strange. 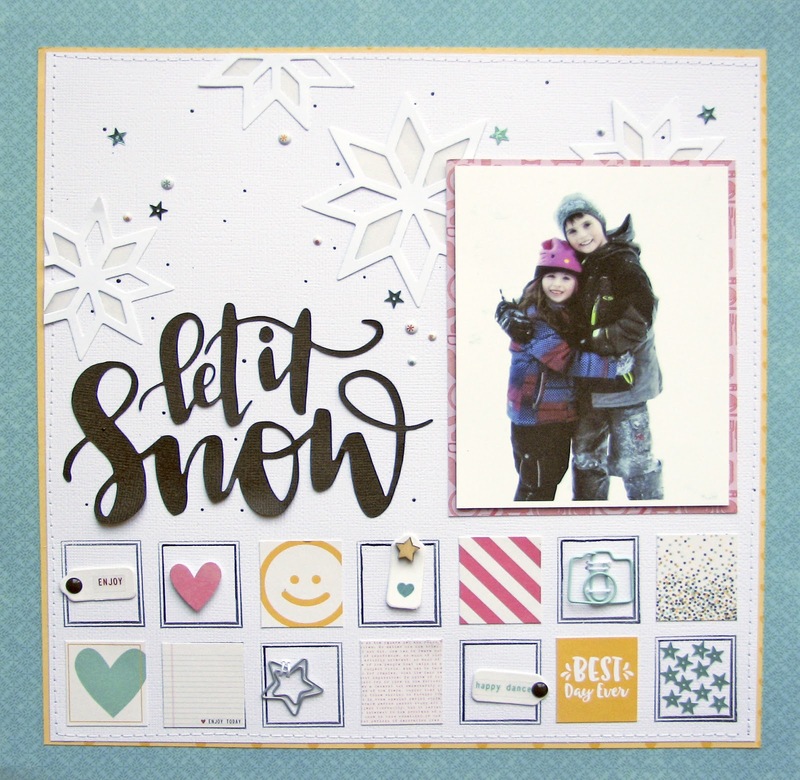 I managed to have one of my daughter on a "warmer" winter day last winter and decided to use it for a challenge on the Shimelle blog on "snowflakes"
I used the Frozen Windowpanes cut file from my digital cut file store - JustNick studio for this page. 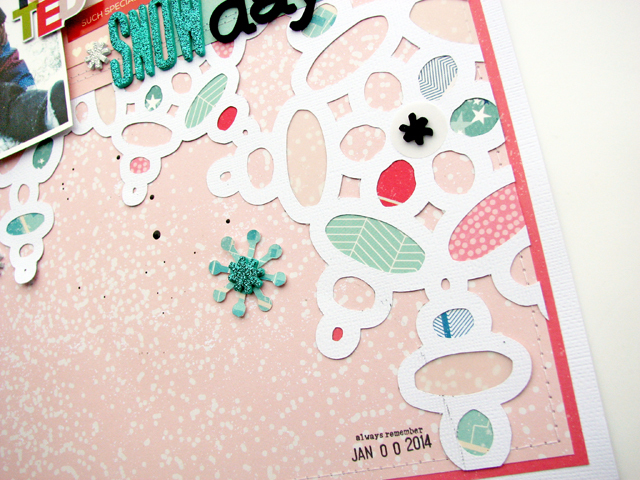 I like the modern rounded snowflake look and wanted to use that with some non traditional winter colors on my page. You can see that I backed most of the cut file with various pink and blue toned papers, along with some vellum in spots too. I like leaving some empty spaces on cut files like this one, so that background pops through a little. I added some tags and smaller diecuts along the top of my page, adding a title and some glittery asterisks from a Thicker set. They seemed to remind me of small snowflakes. I really love how it all came together. Filling a background like this one is a little time consuming, but I love the result in the end. I really must try to remember to get outside more this winter on the days that I am able ! Snow is quite pretty and I need to take advantage of that more! Crop and Create spring 2017 class preview ! The winter season is always a busy scrapping time for me. 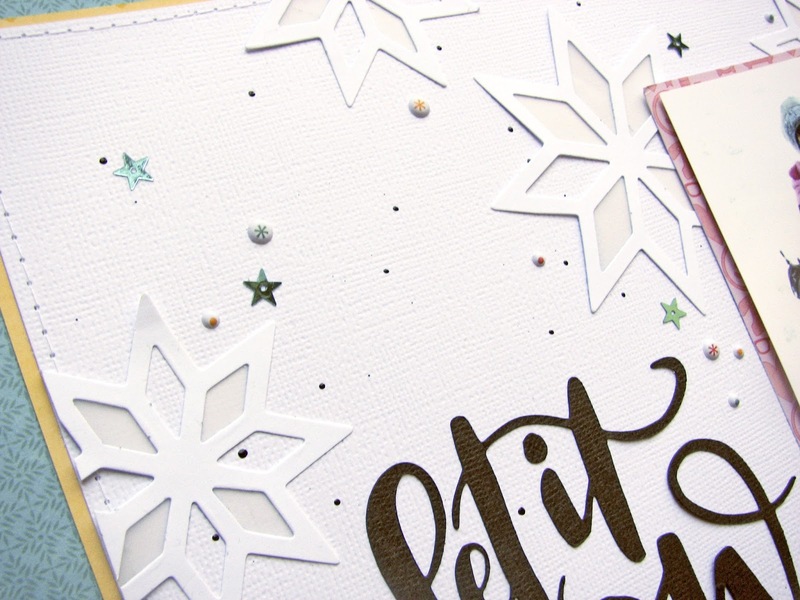 This month, I have been finishing the details on my upcoming classes with Scrapbook and Cards Today Magazine for the Crop and Create events that are happening in Toronto, Moncton, Calgary and Abbotsford! If you are thinking of attending one of these events, I would love to see you in class! 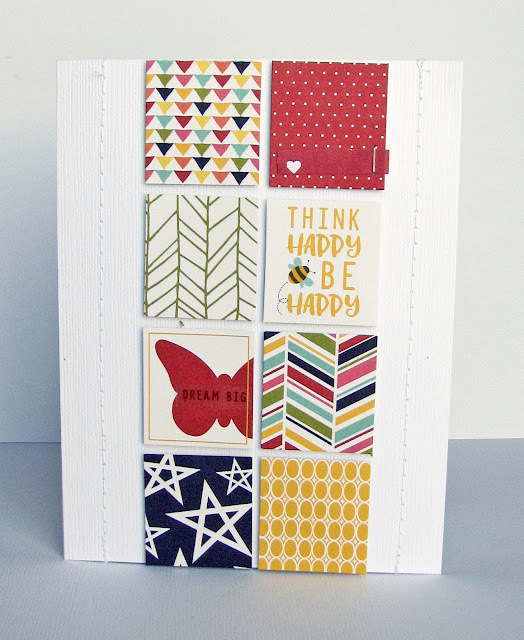 Here is a sneak of my upcoming class - Big, Bold and Beautiful, featuring the Amy Tangerine collection Oh Happy Day. 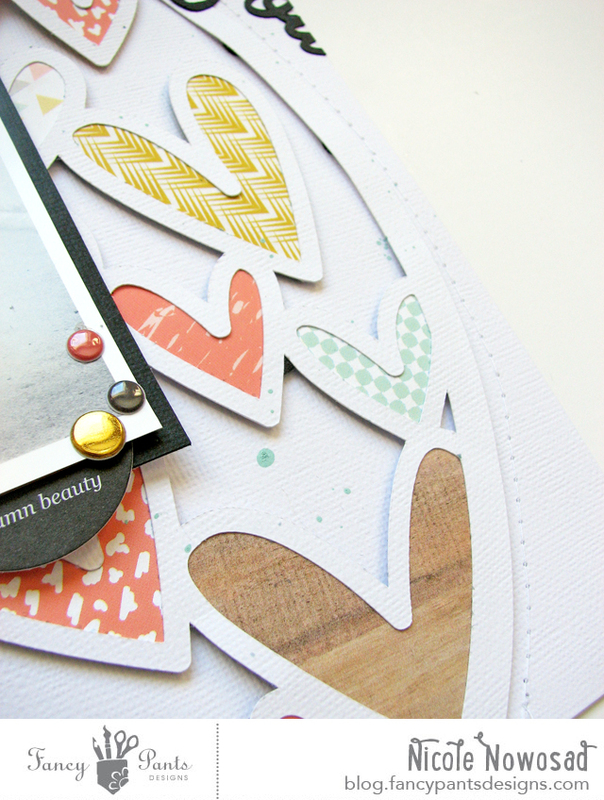 FYI, there is quite a bit of fussy cutting in this class and it makes the projects so pretty! Just love those pretty flowers so much in this collection. I really feel that these 2 projects (a single and double page spread) are totally my style and super fun. 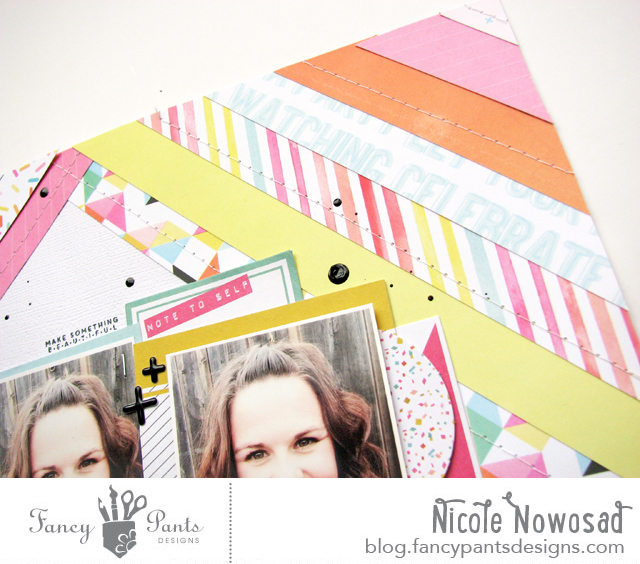 I am excited to share how you can create these projects quickly and easily too! Ah, my girl, so grown up now already - almost 8 in March! This single page is my fave! I am off to Phoenix, AZ today for CHA 2017! I am excited to see all the new collections, meet up with old friends who just "get" what we do! An exciting trip for me! I should be sharing some video on the Scrapbook and Cards Today Facebook page as well as on their Instagram (@sctmagazine). Please stop by and say HI if you happen to check out the video! Fancy Pants Designs sneak peek! Hello! 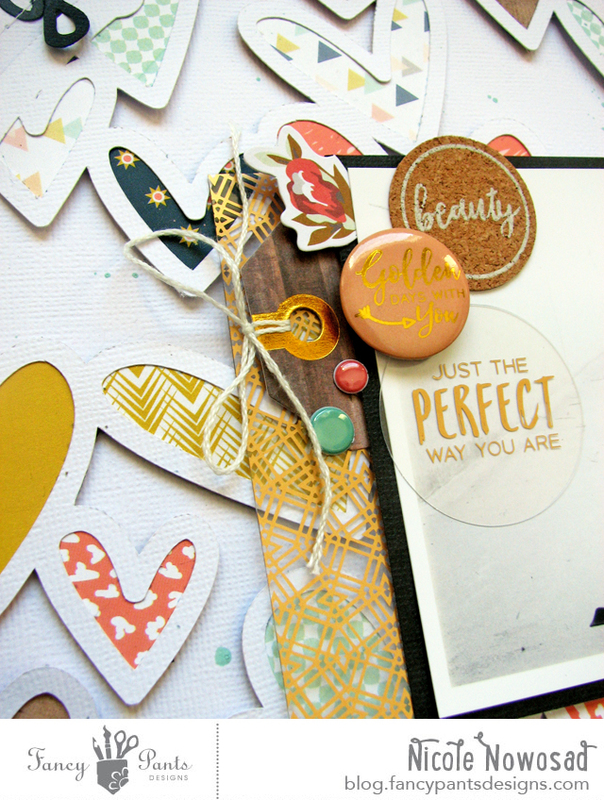 Just quickly stopping in to share a sneak of a project I have up on the Fancy Pants Designs blog today using the lovely Golden Days collection. 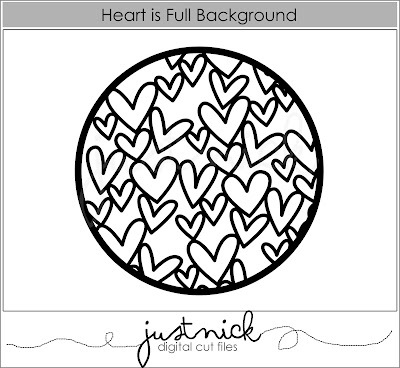 I used the Heart is Full background from my digital cut file store JustNick for the background. 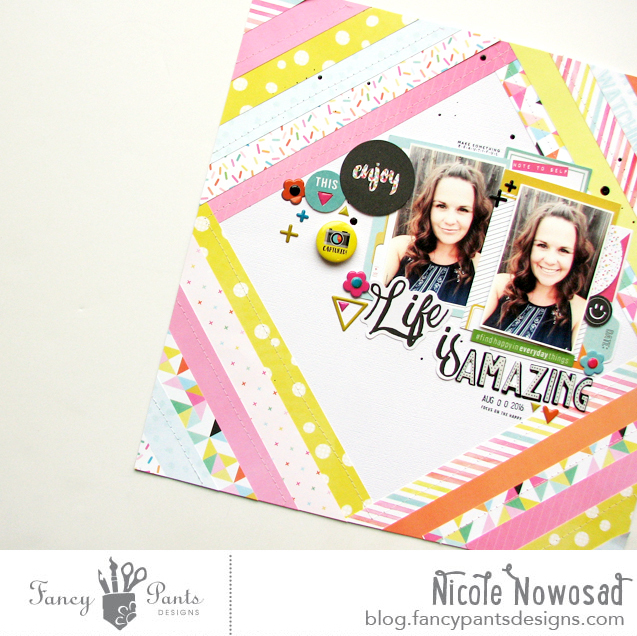 Come back soon for the full reveal, or stop by the Fancy Pants Designs blog today! Fancy Pants Designs - Joy Parade! Hello hello! 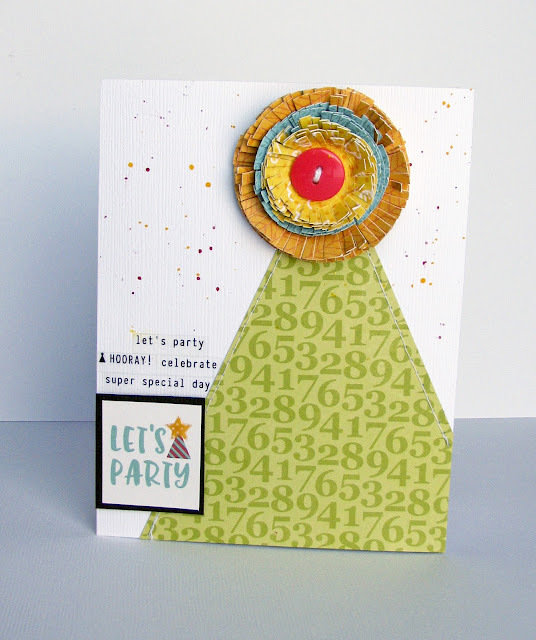 For the last 2 weeks we have been sharing projects on the Fancy Pants Designs blog using the fun new collection Joy Parade! 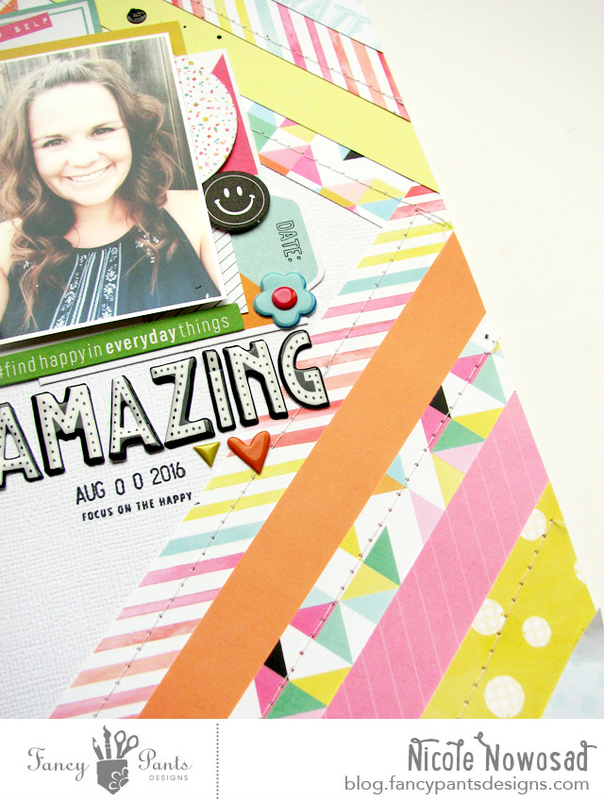 I created a bright and colorful page using this collection - I managed to use a lot of the bright, vibrant paper on my page. I used some simple strips of patterned paper around the exterior of my page to draw the eye to the photos in the centre! A really great way to add a big impact of color and still draw the focus to the photos that you are using. Quite often the "stuff" we put on the page detracts from the photos! Not good, right? This is a great way to easily mix up patterns too. 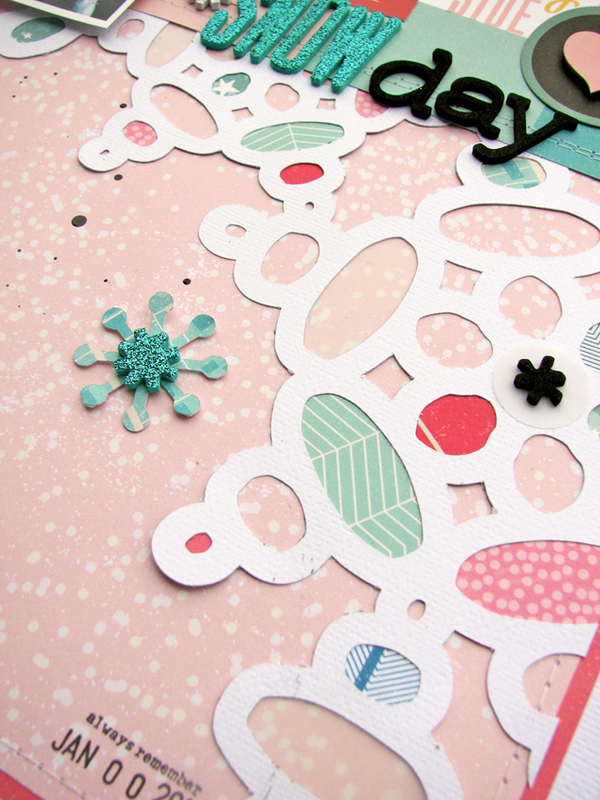 Just use all that pretty color and pattern in smaller doses rather than large pieces mixed together. I used a lot of the new puffy stickers and flair on this page. Love the cool vinyl like look of those puffy stickers. So shiny and pretty. All in all, I love how this page came together. I find it really is about the idea to get the page going. Quite often for me that is a shape or size in my mind and then things just happen! I love how this one came together and I hoe you do too! I created a quick process video for this page, if you are interested - sit back and enjoy! Did you know that Jillibean Soup has come out with a new planner collection! Yup, it's true - it's called Day 2 Day! Now, if you are like me and not a planner person. ie. use a planner but don't "decorate it", then you try to find ways to use these items in other ways right? 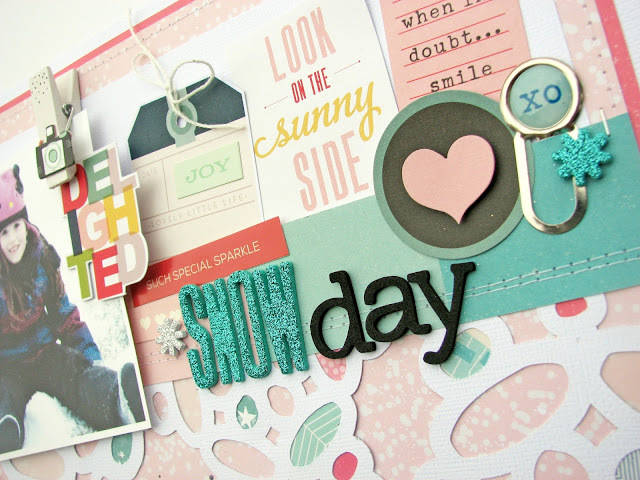 Well, I created these 2 cards using some items from the Day 2 Day collection along with some other items by Jillibean Soup. Check out those awesome clear stickers. Great for planners yes - but also great for card sentiments and to add to layouts too. For this card, I used a lot of the Day 2 Day planner stickers as the "paper" for the card front, adding foam adhesive in behind each sticker to add a little dimension. It's a really simple card, and NO STRESS! I like projects that happen that quickly! 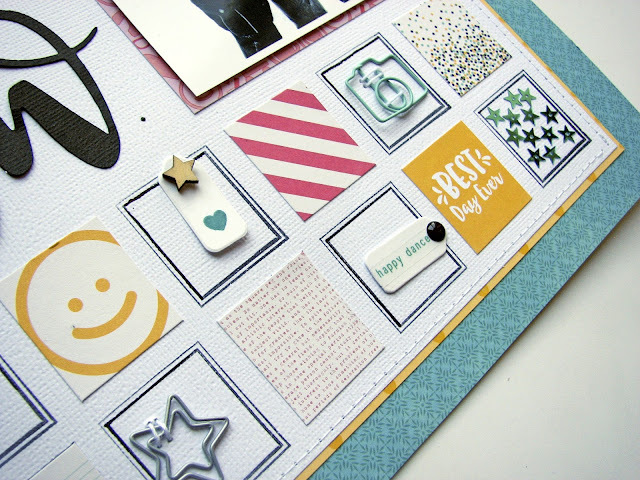 Stop by the blog today to see how our DT also used the Day 2 Day collection to make a whole lotta cards this month! All content including text, photographs and design work is copyright © 2009 - 2016 Nicole Nowosad. All artwork (original unless otherwise stated) is shared for personal inspiration only and may not be copied for any reason; publication or contest entry without my permission. 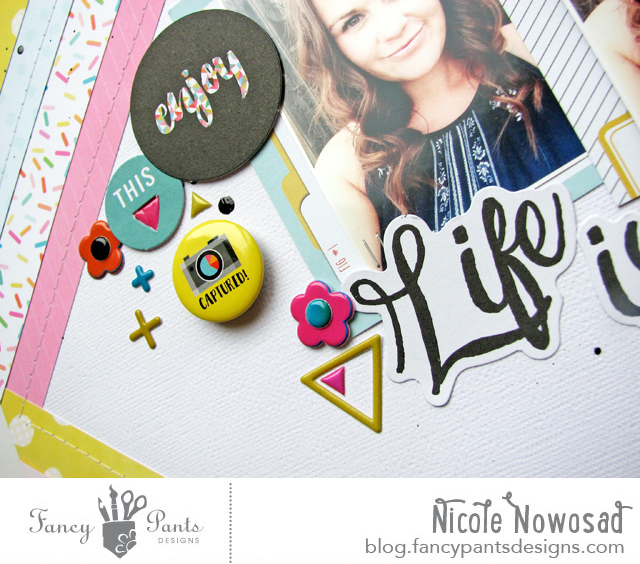 Blog Design by Kristine Davidson. Powered by Blogger.